“We need that people sitting in the VIP stands, but I am also sure that there are more of you in other places of PalaBanca, to give us a hand. It is not possible that cities like Macerata, Trento and Perugia are more important volleyball markets than Piacenza. I can not believe it. These cities have a lot of volleyball enthusiasts, but Piacenza has a very high level entrepreneurial, cultural, educational and historical tradition. Did you hear the appeal of our honorary president Roberto Pighi on Sunday? Did you hear the warm response of the audience? “Losing volleyball in Piacenza would be an own goal that I will not accept until the last second,” Roberto said. Those words resonate in our ears since Sunday afternoon. And we, first of all can, only thank him for the speech and, above all, for the effort that in recent years has allowed us to keep this reality alive. If it were not for him, probably, today our team would have already closed its doors. 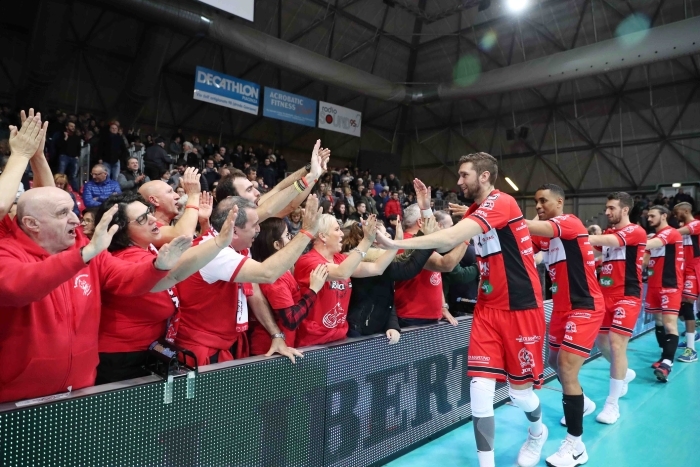 Today, however, we return to talk about “losing volleyball in Piacenza.” We can not think of Sunday without our team, without its colors, without its choirs and choreography driven only by the passion towards the club. We have said it in the past and we say it today stronger than ever: ALL THIS CAN NOT END. Do you remember the almost 1000 people at PalaDozza, dear Piacenza, a small red and white building, when the team brough the cup home? And do you remember the comeback at Trento, the Scudetto, the first Italian trophy that we brought back to Cavalli square in delirium? Do you remember how many emotions we have experienced together, how many sweet tears of joy and love and of disappointment? For this not to end we join the appeal of our president, dear city. In particular to your best in the business field: get ahead, you will not regret! The show that is given in PalaBanca, the affection that is given off and the passion that you breathe are unique. The team of Piacenza has a history that does not deserve to end today! And this is precisely why we want to close this appeal by addressing us, too, dear Piacenza. We turn to mayor Barbieri, Councilor for sport Polledri, the junta and the city council: let’s do it! This summer we greatly appreciated the sudden intervention of the mayor in the PalaBanca issue. Now we are asking for the same momentum to save what has been the most beautiful sporting team of our province for some years now. This passion can not and must not end, dear Piacenza! We will still be by your side, never tired of your colors, to shout louder than ever: Until the end, forza Piacenza!